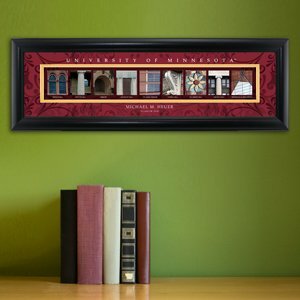 Collegiate framed architecture art spells out the name of each college represented in letters created from actual campus buildings, structures and other memorable images making this a unique gift sure to bring back great college memories! Over 100 Colleges & Universities to Choose From - Big 10, Big 12, SEC, PAC 12, Atlantic Coast, Big East and many more! MATERIAL: Frame is wood with a glass inset. SIZE: Wood and Glass Frame will arrive in one of 2 sizes based on college/university name length, measuring 8" x 20" or 8" x 24". Prints measure 6"x18" and 6"x22"
If you have any questions about this product by Silverfox Promotions, contact us by completing and submitting the form below. If you are looking for a specif part number, please include it with your message. Recycled Nylon, Our Lady of Guadalupe Tote Bag, 4 1/2 x 13" H, 12pk. AT001 Recycled Nylon, St. Francis Tote Bag, 4 1/2 x 13" H, 12pk.